I think the thousands and thousands of animals successfully harvested by hunters wearing no camouflage whatsoever is enough to demonstrate that camo isn’t a prerequisite for a successful hunt. Many have killed animals wearing bright colored shirts and blue jeans. That said, for certain types of animals and certain types of hunting, camouflage can help. Ultimately, when we should use camouflage and what type of camo we choose should be informed by animal vision and perception. Many animals see things differently from humans, so we need to understand what they can see in order to figure out how to hide from their watchful eyes. To make a long story short, our eyes contain cells that are sensitive to light. When light hits our eyes, the cells activate and send light messages to the brain so we can process and make sense of what we’re seeing. These light-sensitive eye cells are also responsible for our ability to see color. Basically, each light-sensitive eye cell is sensitive to only one group of colors. Human eyes have three color-sensor cells: those that pick up bluish light, those that pick up green-yellow light, and those that pick up reddish light. Working together, these three cells are enough to let humans see purple, orange, aqua, and everything in between. Because we have three types of color cells, humans (and other primates) have trichromatic (tri=three, chromatic=color) vision. By contrast, deer and many other game animals have dichromamtic (di=two) vision, meaning they only have two types of color cells compared to our three. Deer, antelope, elk, sheep, goats and pigs only have the bluish light cells and the green-yellow light cells. They can only see in these colors. Purple, red, pink, and orange don’t make an appearance. This is why orange has become the safety color for hunters in the field. While a dude decked out in blaze orange may look like a ridiculous human highlighter to us, he’ll look like a dull, unremarkable yellowish-gray to our ungulate friends. Deer also can’t distinguish between subtle shades of the colors they can see. Medium blue and light blue won’t look terribly different to them. But deer may not be inferior in all aspects of color vision. For instance, deer are more sensitive to UV light compared to humans. While the human eye blocks ultraviolet rays from reaching the light-sensitive color cells, deer eyes have no such filter. Deer don’t have color cells that are especially sensitive to UV ‘colors’, but research suggests that they can perceive some UV light. While my blaze orange hat announces my presence to any humans in the area, it shouldn’t significantly harm my ability to stay hidden from deer. Deer have worse visual acuity than humans. This means that what look like fine, crisp details to us look blurry to a deer. While ‘perfect’ human vision is considered 20/20, deer vision clocks in at a miserable 20/200. They would never be able to get a driver’s license with that type of vision. Pigs’ visual acuity is even worse, likely falling somewhere in the range of 20/300 – 20/1000. On the other hand, deer are excellent motion-detectors. Their visual field is quite wide thanks to the placement of their eyes on the sides of their head. So if you move in sight of a deer, it is pretty likely to notice you. But getting busted by a deer’s vision shouldn’t be your primary concern as a hunter — it’s really not their strongest suit. Deer and other ungulates rely most strongly on hearing and smell to monitor their surroundings, using vision to ‘complement’ these other senses. It is thought that they use vision to confirm what their other senses are telling them. 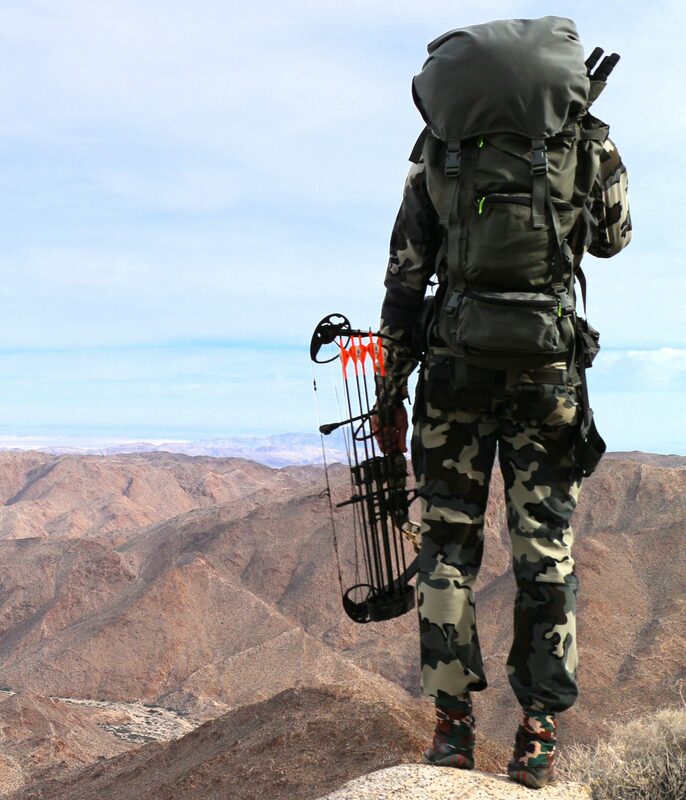 So, do you need camouflage to hunt deer, elk, antelope, sheep, goats, or pigs? Probably not, if you’re hunting with a rifle. If you avoid colors that the animals see best — such as blue — and dress in drab grays or browns, you shouldn’t be terribly obvious to them. If you sit completely still with a good backdrop, a deer is unlikely to visually detect you at a distance, even without camouflage. On the other hand, if you move or silhouette your body against a light background such as the sky (a hunting sin known as “skylining”), a deer can spot you even if you’re wearing the best camo money can buy. 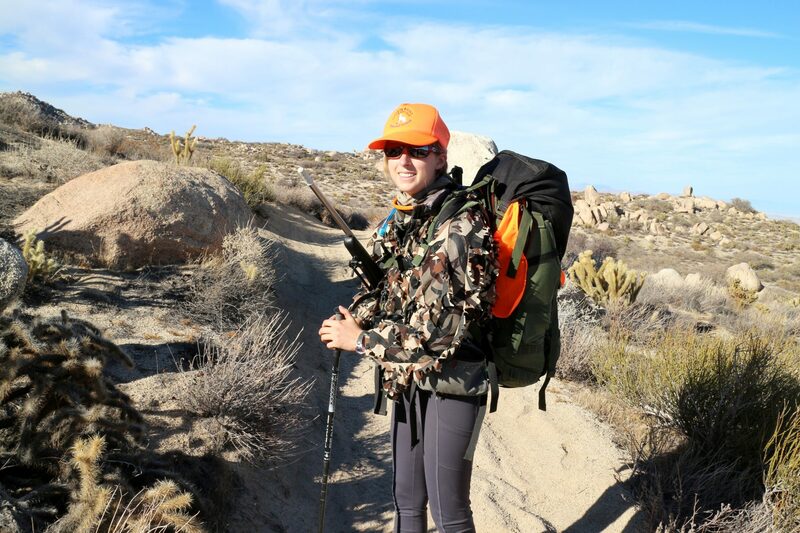 On the day this picture was taken, the desert sun and heat were so harsh that I couldn’t tolerate wearing any of my other heavier (more camouflaged) hunting clothes. What I didn’t realize is that this is probably the worst shirt I could choose to wear deer hunting. Blue can be perceived very well by game animals, so it is advisable to avoid it entirely. This doesn’t mean that camouflage for deer and ungulate hunting is a waste. In fact, I think camo can be helpful for deer hunting even though it’s not necessary. For example, when hunting with a bow — especially when spot and stalk hunting — good camo can help cover up for certain newbie mistakes like getting caught out in the open. Good camo could prevent an animal who sees you (but doesn’t smell you) from figuring out what you are. I think back to a staring contest I had with a hypervigilant doe watching over her two fawns. For a solid five minutes at least she had her eyes locked on me from a distance of about one hundred yards. I was hunkered down in front of a large bush, completely frozen, in full camouflage. The doe was curious and perhaps suspicious, but not scared. The wind remained in my favor and she went on her way. Despite their predator status, coyote and fox have pretty similar vision to ungulates. Canines have dichromatic vision with the blue and green-yellow color cells. Coyotes may have slight UV sensitivity as well, though the data is inconclusive. Notably, predators have better visual acuity than ungulates, though still worse than humans. Coyotes, for example, likely have acuity between 20/50 and 20/100. Perceiving fine details is not their specialty, but they have a sharper eye for detail than an elk or pig. Cats like bobcat and cougar, on the other hand, are technically thought to have trichromatic vision. At first glance it sounds like cats should have similar color vision to humans (after all we both have three types of color cells in our eyes) but it’s a bit more complex than that. While the three cell types in humans are sensitive to a wide range of colors, the three cells in cats seem to cover a narrower range. As a result, cat color vision may not differ substantially from ungulates or canines.1 They are fine at seeing blue and terrible at seeing red. Orange will look more like a yellowish-green to a cat. Their visual acuity during the day seems to be similar to coyotes (and notably blurrier than humans) but at night cats’ vision is much sharper than ours. While the world will look mostly black and white, felines excel at seeing detail in low-light conditions. So, do you need camo to hunt predators like coyotes and bobcats? I would say that it’s important but not critical. Although predator vision is fairly similar to ungulate vision, the way that predators are hunted (e.g., using sounds mimicking prey in distress to lure predators from afar) may increase the value of good concealment. A called coyote will approach the source of the sound, often at close range, looking for something. That animal will be scrutinizing his surroundings with great curiosity to find the source of the noise. Any movement or usual shape will be noticed. In contrast to the animals discussed above, birds are a different story when it comes to vision and perception. In fact, birds blow most other animals, including humans, out of the water with their exquisite sight. To start, most birds have tetrachromatic (tetra=four) or even potentially pentachromatic (penta=five) color vision, meaning they have more types of color receptor cells in their eyes than humans have. Birds can see the full rainbow even beyond what humans can see. Birds can distinguish between very similar shades of color. Birds also have color cells in their eyes that are maximally sensitive UV spectrum light. 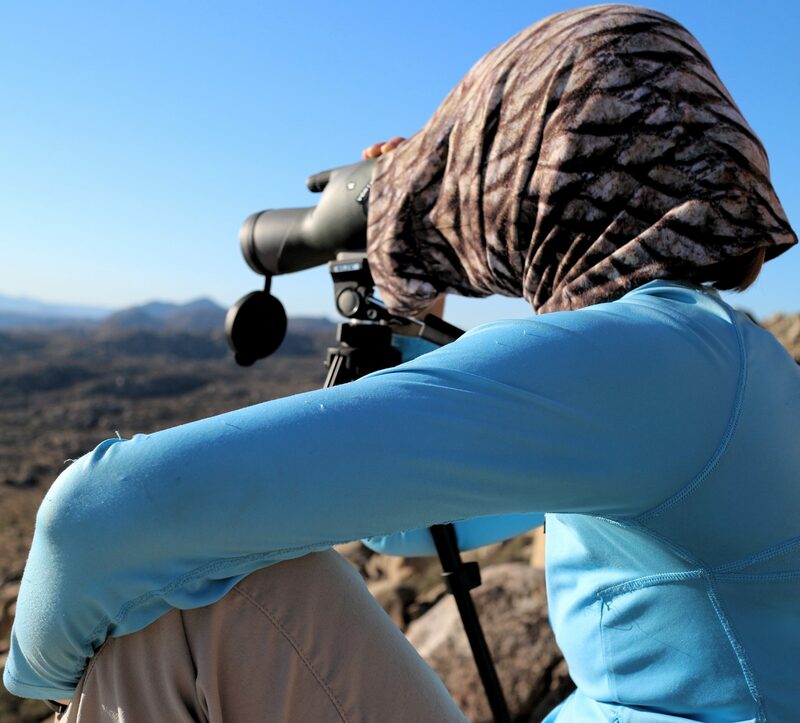 While deer and coyote eyes don’t block UV, leaving open the possibility that they can detect some UV light, birds undoubtedly excel at UV vision. A turkey’s vision is better than a human’s in many ways. If you’re going to pursue these birds you’ll need to conceal yourself extremely well. So birds will notice things about your outfit that you don’t even have the capacity to perceive. And blaze orange will look like blaze orange to them. This is why some types of bird hunters (typically turkey and waterfowl hunters) are often exempt from wearing orange. 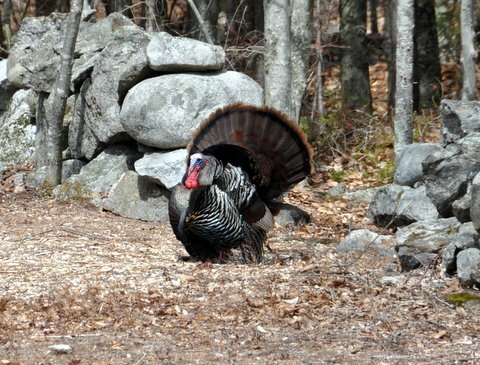 Both turkey and waterfowl hunting can rely heavily on deception (fooling the birds with decoys, staying hidden from them, and often luring the birds to come close to you using calls), and a bright orange hat would be a dead give away. So do you need camouflage to hunt birds? If your hunt relies on staying hidden from birds as they fly over or are lured toward you, then yes, camo is a very good idea. You want to blend into the environment as much as possible. However if your bird hunting relies more on ambush (e.g., using a dog to find and flush birds hidden in the brush) where the bird isn’t likely to see you until it’s startled enough to fly, camouflage is likely unnecessary. Think of all of the images you’ve seen of successful pheasant hunters wearing bright colors. Overall, whether you need camouflage to hunt depends largely on what type of animal you want to pursue. For most upland bird hunting, camo is made unimportant by the hunting method. The birds are typically found by a dog and ambushed — ‘flushed’ into the air where the hunter is able to take a shot. For ungulate and predator hunting of all types, camo is helpful but not required. If you’ll be bowhunting, camouflage becomes much more important. Similarly, good concealment may be more important for predators calling than for spot-and-stalk or tree stand deer hunting. For the keen-eyed turkey and waterfowl, camouflage is necessary. I decided early on that as a brand new hunter, I needed all the help I could get. So while camouflage may not have been necessary for me to pursue rabbit, hare and deer, I wanted to give my inexperienced self the best possible chance at harvesting meat for the table. But once you’ve determined whether camouflage clothing is a worthwhile investment, how do you go about choosing a brand or pattern? 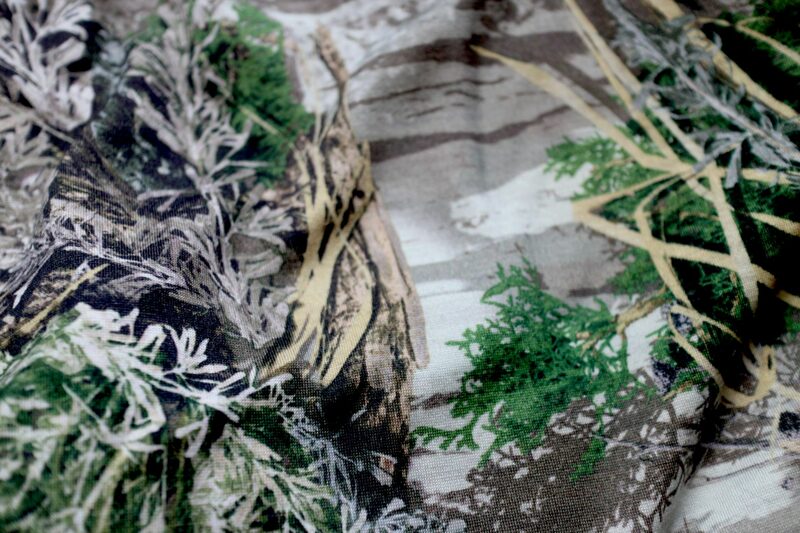 There’s certainly no shortage of different camouflage styles marketed toward hunters. Don’t base your camo selection only on how the pattern looks up close to the human eye. From left to right: KUIU Vias, ASAT, Realtree Max-1, and ASAT 3D Leafy. I remember standing in the store aisle, surveying my camouflage options. Should I pick the pretty leaf-patterned camouflage or the weirder, slightly more military-styled patterns comprised of abstract shapes? Would I look good in the tree print? There aren’t any trees in the desert where I hunt, so that seemed like a poor choice. But there aren’t military patterns in the desert either, so maybe I was just out of luck. I scanned the options further. Some looked like regular shirts and pants, while others were advertised as ‘3D’ camo and looked more ruffle-y, like a pile of leaves. So what’s the deal with all of these different types of camo? And which one is best? While there’s no one-size-fits-all answer, I’ll highlight the pros and cons of mimicry patterns, break up patterns, and ‘3D’ camouflage. Many camo patterns attempt to visually mimic specific terrains or habitats. The most well known hunting camo looks a bit like a deciduous tree. It has green leaves, some twigs, and maybe some bark patterns. Other types of mimicry patterns might try to resemble a marsh or a snow covered plain. Their base colors will match the terrain for which they are designed to be used. RealTree Xtra is just one example of a camo pattern that fits best under the mimicry category. The advantage of mimicry patterns is that, if well matched to the terrain, they help a hunter blend with the surrounding environment quite well. But there are a number of disadvantages too. First, unless you hunt only one region in only one season, you may find that your mimicry camo is not versatile enough. What blends well in early autumn when your hunting grounds are still fairly green might not blend as well in early winter when the world is brown and white. Or, what works in the low, arid desert might poorly match the treed forests nearby. One solution would be to buy multiple camo outfits for different locations or different seasons, but this may be unattractive to the minimalist or budget-conscious hunter. A second disadvantage inherent in some mimicry patterns is that they may not do enough to disguise the human silhouette. Let me backtrack for a second to explain this one. Earlier in the post I mentioned that ungulates like deer, elk, and sheep, as well as predators like coyote and bobcat, are not especially good at distinguishing between similar shades of color. They are also poor at seeing fine details — their vision is more blurry than ours. If you look at some mimicry patterns on the market, you’ll notice that their print includes some lovely detail. Branches, leaves, and grasses printed on the clothing look almost like photographs of a patch of forest. Subtle shades of brown, tan, and green make the camo look quite realistic to us. Unfortunately, these fine hues and details will be lost on ungulates, canines, felines, and most other mammals. Their vision just isn’t good enough. In fact, even our vision isn’t good enough to resolve that detail once we move out to hundred yards or more. As a consequence all of the fine colors and details can blend together to look like a fairly uniform blob of drab color. This problem of turning into a blob at a distance can be given a fancier name: ‘isoluminance’. Realtree Max-1 is an example of a traditional mimicry pattern with some added light-dark contrast that may help with form breakup. Now if that human drab blob is sitting among bushes or grasses or up against a large tree, he’ll likely blend in just fine if his mimicry pattern perfectly matches his background. But if that same hunter has a less-than-ideal backdrop (perhaps of a different color or vastly different texture), his or her human form can be readily discerned. A human silhouette is a very unique shape and one that most game animals have learned to associate with danger. A hunter that is the color of tree bark will still look like a human and that’s a bad thing for a hunter to look like. To address this concern, many newer mimicry patterns are touting features that help break up the human outline. Other camo manufacturers have made breaking up the human outline their number one priority. These camouflage designs are referred to as ‘breakup’ patterns. Breakup patterns are designed less to conceal and more to disguise. What does that mean? Well, whereas mimicry patterns try to blend colors with the terrain so that the hunter can act like a chameleon, breakup patterns don’t try to blend. Instead, breakup patterns try to make a stationary human object look like anything but a human. Imagine a hunter sitting on an open hillside. Instead of trying to make the hunter perfectly blend in with the background, a breakup camo pattern might make that person look like a rock or a log. The form might be distinguishable from the background but won’t be identifiable as a person. A log or a jumble of rocks does not typically intimidate animals. As a result, breakup patterns can provide great disguise. 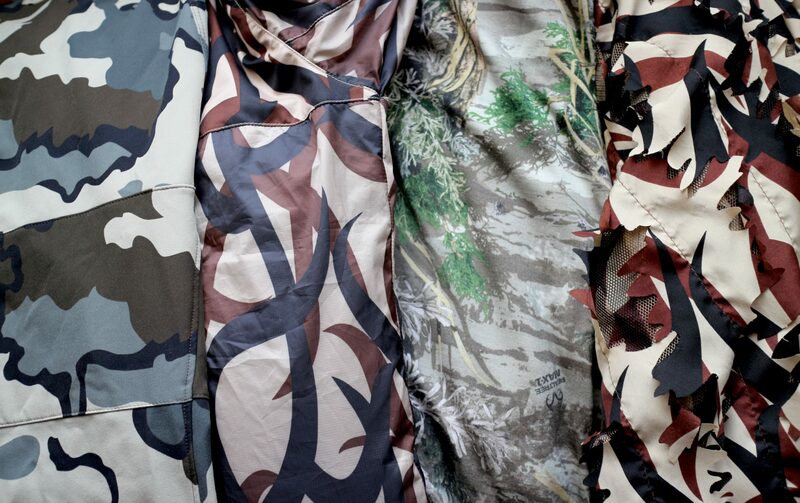 KUIU Vias is one example of a breakup camo pattern. If you start looking into different brands of breakup camo, you might see terms such as ‘micro’ and ‘macro’ thrown around. Micro patterns are small designs meant break up the human form from closer distances, typically twenty to forty yards. By contrast, macro patterns will use larger blocks of color to disrupt the human outline from distances of a hundred plus yards. Much of the state of the art breakup camo integrates both micro and macro patterns in their design to provide maximum disguise and versatility over a wide range of distances. Overall, both Nick and I prefer to wear breakup patterns to disguise our form in open country, rather than try to blend in to a diverse desert terrain. Be aware that breakup patterns can appear a bit weird to the human eye when examining the camo up close and personal. Often they involve large patches of higher contrast colors and are sometimes bereft of any details that resemble nature. They don’t look like a tree or a bush — they don’t try to mimic anything, really. But when you look at breakup patterns from afar, the results are compelling. As an example, here’s a montage of images from an ASAT promotional video that gives both near and far perspectives on how their breakup pattern looks across a variety of terrain. Other manufacturers’ breakup camo performs similarly. Disrupting and concealing the human form is taken to another level of excellence with so called three-dimensional camouflage. 3D camo adds texture to regular clothing to make the hunter look even more like a harmless pile of brush. The ASAT Leafy suit is the 3D camo that Nick and I have tried, but there are many other 3D options. Overall, 3D suits will break up your outline superbly. The downside is that they can be a bit cumbersome. When I walk around in the wilderness with my 3D camo I much more frequently get caught on twigs or cactus spines, simply because I’m poofier and covered in frilly pieces. 3D camo is not particularly pleasant to hike in. If you plan to be on the move a lot during your hunt, I would not recommend 3D camouflage. On the other hand, if you plan to be stationary, 3D camo could serve you well. 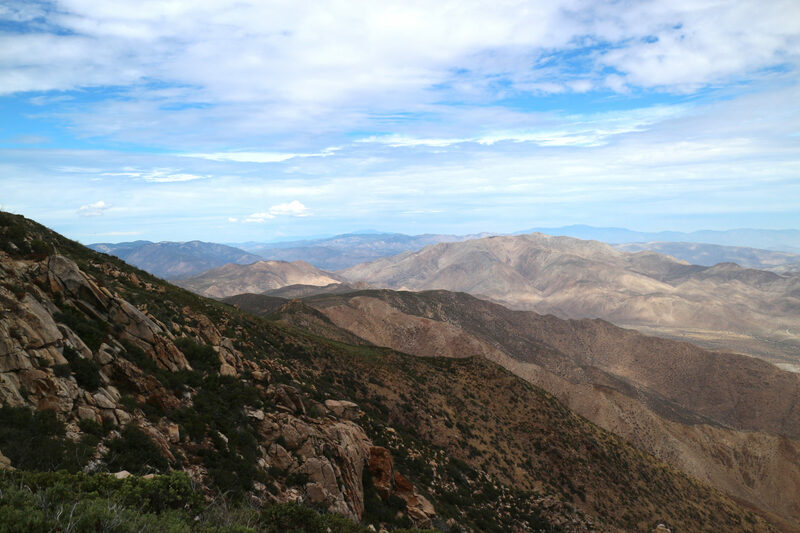 There’s always the option of hiking in to your hunting spot in normal clothes and donning your 3D camo once you get there. Whether or not you truly need camouflage to hunt, camo can give hunters an extra advantage. If you decide to shop for camo I implore you — don’t base your decision purely on how the camo looks when you’re holding it at arm’s length. You need to know how it looks to game animals and how it performs at hunting-relevant distances. Close up photos of hunters in camouflage help you understand how well the camo matches a particular terrain but don’t demonstrate how the camo would actually work in the field. Here’s one camo comparison that shows camo at a distance (posted over at Graylight Productions). They compare Realtree AP, ASAT, Realtree Max-1, Gore Optifade, KUIU Vias, and Mossy Oak Treestand. Be sure to click through to the second page of the thread to see the images rendered in grayscale. Grayscale is a poor but still somewhat useful stand-in for ungulate vision and helps highlight the difference between breakup and mimicry patterns when color is removed. Remote Pursuits has put together a collection of camo photos in both color and grayscale that’s worth checking out, too. If you’ve looked at enough photos of hunters in camouflage, you may have noticed that light-toned human skin really stands out. Uncovered faces and hands really seem to ‘pop’ while the rest of the body is concealed by camo. That brings me to my second tip. If you want to get serious about camouflage, you’ll need to wear gloves and some sort of face covering. Face paint is certainly a nice option. Face paint should be used to cover your skin with colors that blend with the rest of your camo and break up the symmetrical structure of your face. Try following these camo face paint tips if you’re interested. If paint doesn’t appeal to you, many companies make neck gaiters and balaclavas to match your camo outfit of choice. Nick and I have preferred wearing neck gaiters over paint thus far because gaiters double as lightweight sun shields can be worn for days at a time in the backcountry without needing to wash or reapply. I also have a few tips for new hunters on a budget. As you look around the world of hunting-specific clothing, you may be shocked by some of the price tags you see from top companies like First Lite, Sitka Gear, KUIU, etc. A full system of camo from base layers to warm jackets can be extremely expensive. If you are unable or unwilling to drop that kind of cash but still want good camo and comfortable outdoor attire, I suggest buying one layer of full camouflage large enough to wear on top of the non-camo gear you already own. When we first started out, Nick and I each purchased a full ASAT 3D Leafy suit as our only camouflage. Despite the hassles of having the 3D camo get caught on local plant life, it worked great and didn’t break the bank. I actually still wear my ASAT 3D top as my primary camouflage over non-camo clothing as I wait for baselayers and outerwear in my favorite breakup patterns to be made in women’s sizes. I had to give up on wearing the 3D bottoms because they were simply too cumbersome for hiking. While I don’t wear any camouflage on my legs, I was still able to harvest a mule deer in open country this season. Finally, be careful how you wash your hunting clothing. Many modern detergents include fabric brighteners. The extra UV brightness in your clothing can make you more easily detectable to animals, particularly to birds who possess acute UV sensitivity. Deer, coyote, and other mammals who lack UV receptors may nonetheless still be sensitive to UV light, so it’s better to be safe than sorry. There are companies that make laundry detergents without optical brighteners, which is great. But remember, you’ll need to find soap that is both brightener-free and scent-free. There are laundry products marketed specifically to hunters, but there are plenty of non-hunting products that will do the trick. I’m currently using this Ecos laundry detergent, if you’re curious. To sum up, camouflage is helpful, but not necessary in many hunting situations. For upland bird hunting it is less important, for rifle hunting deer it’s of moderate importance. Camo is of moderately high importance for bowhunting ungulates and for all predator hunting. For waterfowl and turkey hunters, camouflage is critical. There are myriad camouflage options on the market. Try to see your camo options through the eyes of your quarry by studying animal color perception and visual acuity. Often trying to blend in with your surroundings using mimicry patterns may come at the cost of disguising the human outline. We prefer to wear breakup camouflage patterns to disrupt animals’ ability to perceive our human shape in open country. But even the world’s best camouflage outfit couldn’t keep you hidden if an animal were to smell you, hear you, or see you moving. So whether you wear jeans and a t-shirt or the most elite camouflage available, remember: clothing can never substitute for smart, skillful hunting. What has your camouflage experience been like? Are there any camo questions you’d like to know more about? Let us know in the comments! Wonderful article, thanks for writing it up. Hey, just starting to get into hunting. Mostly bow, but I would assume that because of the closeness you would recommend break-up to all archers? Also, are there hunting gloves you can wear in the heat that have finger guards for bows? I hate having to layer too much as it gets very hot in my part of California. Great article, I am actually using it as a source for a research paper, so thank you! I really liked this article; however, many of the links reached not found notes. camo is very useful for hunting!